We were a bit late packing up in Kalgoorlie and for the first time all trip, we missed check out and didn’t leave the caravan park until 10.30. Although leaving Broome felt a little like the ‘trip home’ we still had so much to see and do and went from coast to inland and back to coast again. 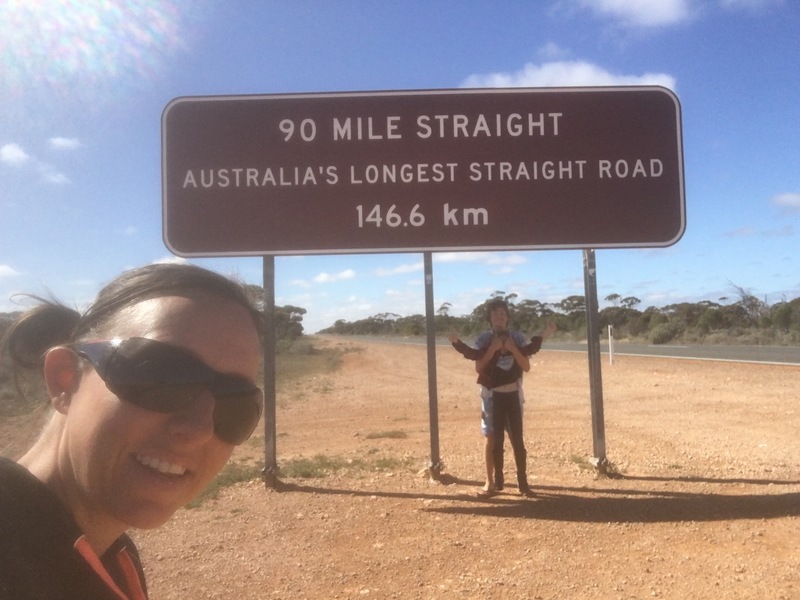 Leaving Kalgoorlie to make the hike across the Nullarbor – that feels like we’re ‘driving home’ and the trip is most definitely ending. I had a draft itinerary for our last month of the trip (I didn’t bother writing it down or even thinking about it until we were at 80 Mile Beach and figured I should try and at least make sure we got home on time) and while we’d tweaked it here and there and swapped nights and locations a few times, the plan for the Nullarbor was really just to get across it as we’re running out of time. Day one, I’d just hoped to get from Kalgoorlie and stop somewhere along the way once it got to late afternoon with no particular preference as to where. The volunteer at Parry Beach had given me a few good spots to stop at as had our KC family friends so I thought we’d at least aim for one of them if possible as we went. I stopped at Bunnings in Kalgoorlie for some zip spray to help with Master14’s bed fly incase we needed to unzip that on the way home, we grabbed the obligatory Saturday morning sausage and then we were on our way. We were only stopped for fuel along the way wherever we happened to be when I got to half a tank so I was cruising quite comfortably on about 95km/h with 3/4 of a tank of fuel when the revs on my car suddenly spiked and I realised that I was in nuetral – the car had popped out of fifth gear. I put my foot on the clutch and put it back into fifth but then the same thing happened so I tried to hold it in fifth for a bit but that didn’t work either. I put it into fourth and all was ok so I slowed down and kept driving to the next service station which happened to be in the middle of nowhere and no town to be seen. I asked the French guy behind the counter if there happened to be a mechanic nearby but he didn’t know what I was talking about and asked me if I wanted Diesel fuel so I thanked him and went to the payphone to call my mechanic in Melbourne. I didn’t really want to have to drive to the nearest town and stay a few days to wait to get my car fixed – by now I was sick of other mechanics working on my car and things going wrong with it. After a reassuring phone call to him, I was back on the road with the knowledge that I was driving home to Melbourne in fourth gear and only able to do about 85km/h. With all of the delay with my car and having to drive that bit slower, we didn’t get very far along that first day and made our stop at Newman Rock where we parked near a fire pit and table and chair setting. We were the only ones camped there but after taking a walk later on we found a couple of other campers further down the track. I’d had people tell me not to camp all alone at these roadside stops – I’m not sure who they think is just lurking in the bush in the middle of nowhere but we felt quite safe and were looking forward to watching the stars by the fire for the night. Then it rained so our plans for the fire changed to sitting indoors and keeping warm. Day two, I wanted to at least get to Eucla so we were off by 9.30 and driving through intermittant rain and seeing a lot of the same scenery as the day before – trees and shrubs of varying shades of green. Until we hit Madurah where we stopped at the lookout for a great view of the Hampton Tableland which looked like a vast area of grey/green low lying shrubs with the odd tree popping out. 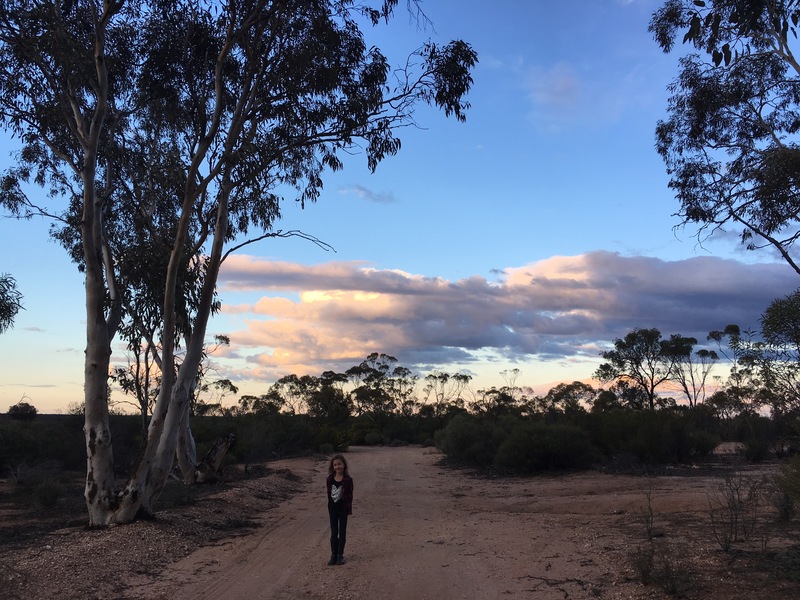 I stopped for fuel at the Eucla caravan park and decided I’d actually had enough driving so paid for a site and managed to find a secluded little spot amongst some trees with a fire pit where we managed to feel like we were still bush camping. As the weather was a lot cooler, I’d planned to put dinner on in the thermo pot in the morning so that by the time I’d driven all day and set up camp I could just sit down and serve up dinner rather than the hassle of cooking – this was quite possibly the best plan I’ve had and was working a treat. Day three, I paid my $1 for a five minute shower which was enough to wash my hair and it was back on the road again for another long day of driving. My back at this stage has really started to play up and cause me quite a bit of grief and discomfort so I’ve lathered it in Rapigel and popped Nurofen to help with the driving. The landscape changed again as we drove through the Nullarbor National Park it was back to trees and shrubs until we hit the Nullarbor Roadhouse and the Western end of the Treeless Plain (which Master14, being the teenager that he is, liked pointing out what must’ve been the only tree in sight). 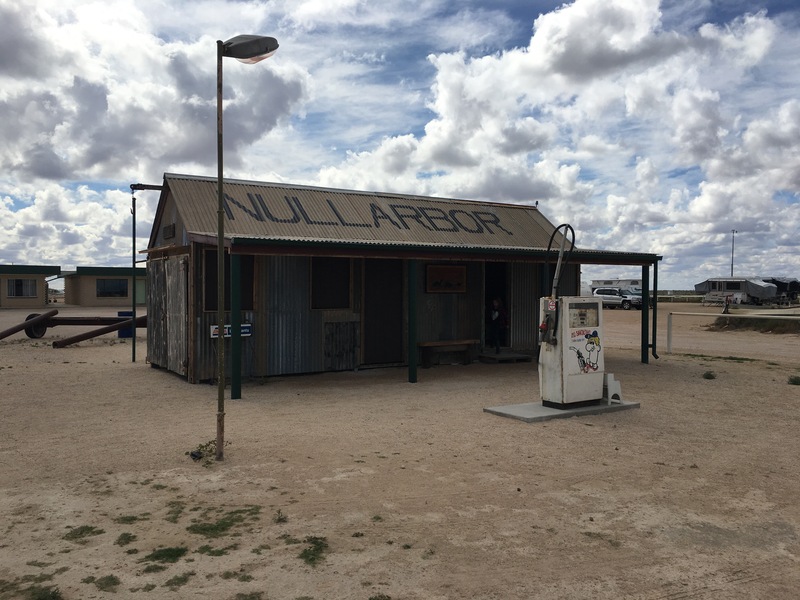 We stopped at the roadhouse for fuel and some lunch in the car before a quick make believe game of shops in the old Nullarbor Roadhouse complete with old fuel pump and rusty cash register. Back on the road to the Head of Bight where we went to the visitor centre to do some whale watching. This week (and this year) is a record with around 170 Southern Right Whales in the Bight (including 81 calves and their mothers). We got to see around 20 whales and their calves while we were there – it was amazing. Some were just floating, others breaching or waving their fin and tails in the air. The coast itself was breathtaking and made you feel like you were standing on the edge of the world. 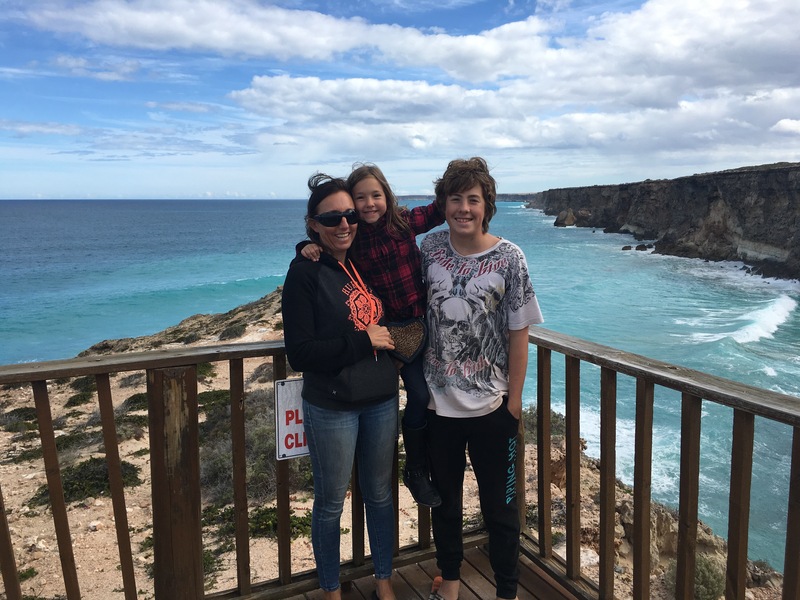 We spent a fair amount of time at the Bight so it got too late for us to get to Ceduna for the night and we stopped at Cohen Rest area where we ate our preprepared hot dinner around another campfire telling ghost stories and looking at the stars. Until of course Miss6 stole my camp chair so I sat in hers – let’s just say that kids camp chairs (or even just cheap adult ones I think it is) don’t have drink holders that are sturdy enough for a glass of wine – mine went A over and went all over me and the chair. It was bedtime for us all after that. Day four and it was raining when we woke – I love the sound of rain on the roof – until I remember that I have to pack up the camper. Luckily it always sounds worse than it is and we managed to pack up without getting terribly wet. For most of the afternoon yesterday and for most of the day today we had some lovely green pastures as our scenery and even a windmill or two (or ten or more when we drove through the pretty town of Penong). 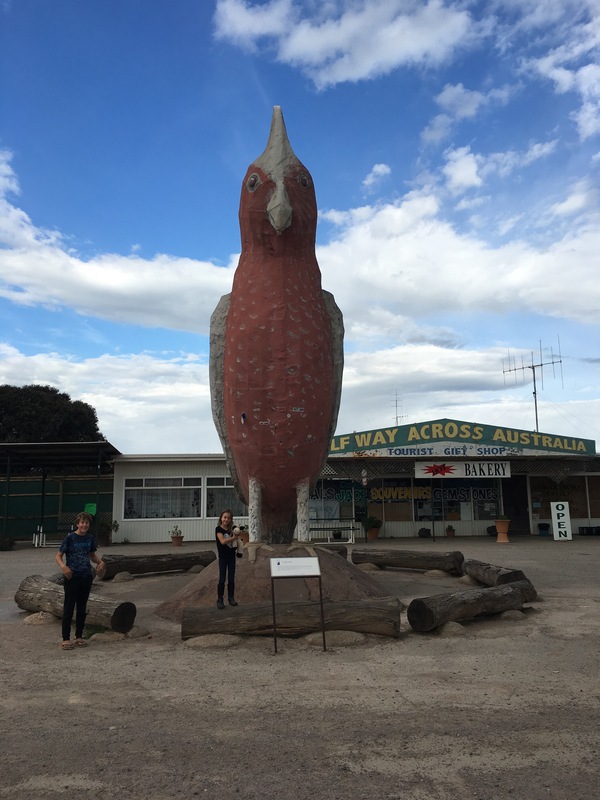 We also passed through the town of Kimba – apparently halfway across Australia and home of the Big Galah. Although I was very tired, I managed to get us all the way to Port Augusta for the night. We had thought about doing a night in Coffin Bay but I realised that all we would’ve done was set up the van, eat dinner, go to bed then pack up and go in the morning and miss anything good about it. By getting to Port Augusta now, it means that we can spend three nights in the Barossa Valley and possibly even squeeze in a sleep in before the final drive home to Melbourne.